"La mela in Tasca" is a cover version of "Starvation"
"Jmanja" is a cover version of "A day in heaven"
"Piramidi di vetro" is a cover version of "Queen of the universe"
in my eyes a thousand moons. sulle tue inquiete mani la fortuna io la porterò. anche tu mi hai catturato, mille lune siamo io e te. on your restless hands luck I will bring. in every line of yours? you too have captured me, a thousand moons are you and I.
that you have in your pocket. * "Red lips / I extended": this is a very literal translation.A less poetical version would be "I extended (my) red lips (towards you)"
Note: Jmanja is probably intended as a woman's name. 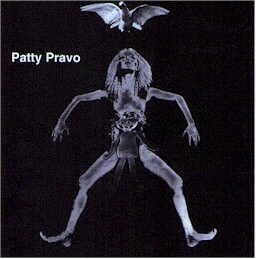 Patty Pravo pronunces it as "Y-man-yah" [it is in Italian] and it is deliberately meant as obscure, mysterious. la Scio* sa protegger me. in cui non credi più. la Scio sa protegger me. you don't use any longer. in which you don't believe any longer. * Scio"... "scìo" is what it sounds like in the song, there is no other word in Italian which is pronounced "shìo". As for the meaning, "scio" is either a verb in Italian ("I ski"), or the Italian name of a Greek island, Chios. Italian lyrics of "Sconosciuti cieli" transcribed by: Paolo Cadeddu.